Volunteer While You Study Spanish in Ecuador! Volunteering in Ecuador while you are learning Spanish, or once you have finished your studies, is a great way to not only immerse yourself in the language by practicing every day with local people, but also offers the chance to experience and learn about a new culture as well as give something back to the people and places you are visiting. We offer a "Volunteer Quito" and a "Volunteer Cuenca" program. This is a one-month program of volunteering and Spanish classes in a small group. We are partnered with local organizations in both Quito and Cuenca to offer options to volunteer with day-care centers and young children, elementary and secondary school teaching, children with learning and motor-skills difficulties and aged homeless persons. Once you have finished your Spanish course you can choose to volunteer outside of Quito or Cuenca including on the Galapagos Islands. Projects include conservation and agriculture, animal rescue, teaching, health, community development, construction, and reforestation. Our volunteer counselors will be happy to work with you to define a suitable project for you, and we will accompany you to the volunteer site and make sure that you get settled in, and offer ongoing backup until you finish your placement. 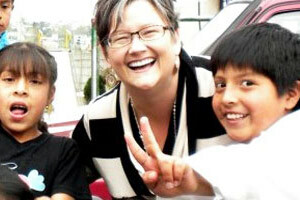 "My Spanish improved so much during the month I volunteered in Quito. Being at the daycare centre each day and interacting with the kids there was the best way to keep practicing. . . Yanapuma's volunteer counselors were great and made me feel really at home when I came in for classes every day. Thanks!"